Thanks for stopping by today. I hope those of you who have been under the weather are feeling better. Well, I have some exciting news. . .
We are officially in escrow on a lot, and we're planning to build our own cottage. I'm pretty stunned, actually. As plans unfold (no pun intended), I'll share more details with you. relating or belonging to the present period in history. This is a section of our living room. It's where I like to relax after a hard day of blogging, reading blogs, linking up, pinning. . .(it's dirty work, but someone has to do it). Okay, ignore the oh-so-attractive red flashlight on the chest in the background. Captain thinks we need it there in case we ever lose power. I should have taken this shot over without the red intruder, but I didn't. There, I've said it. I've shown my chair before, but let's take a closer look. 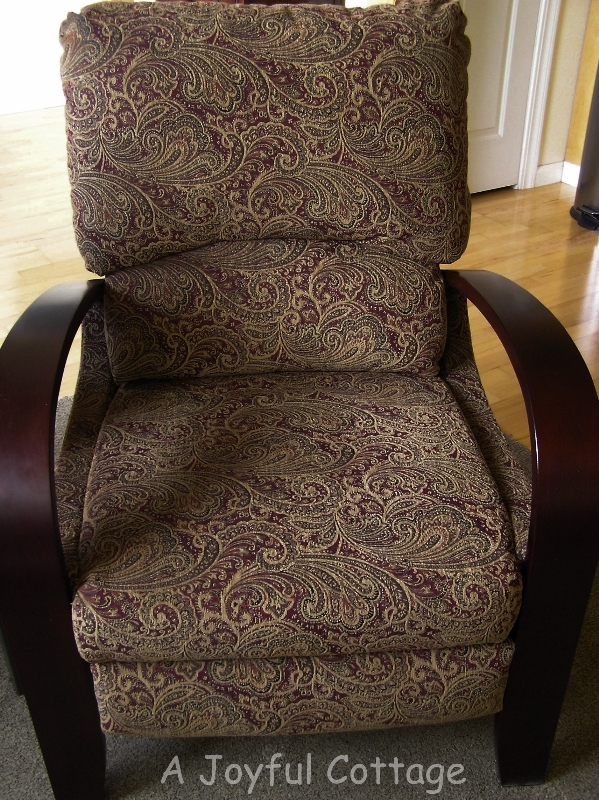 It's a recent purchase, manufactured by Lane in a custom fabric. 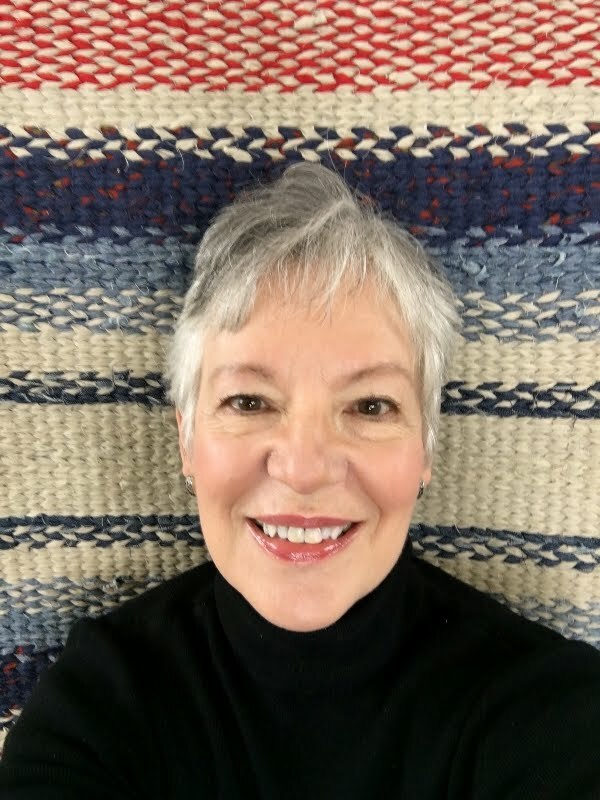 I chose this particular chair because it's extremely comfortable, it reclines, it was moderately priced, and in this fabric it looks less contemporary and more "vintage". 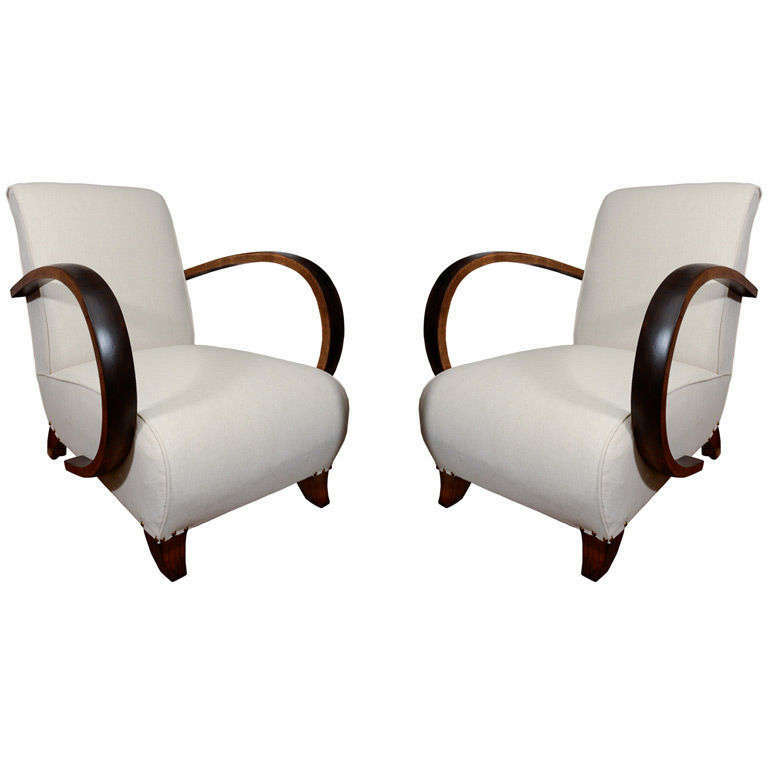 The style is reminiscent of these French hoop arm chairs from the 1930's. I paired it with this end table. . . Which was a yard sale find. It came home in an atrocious coat of black paint, with that sassy green knob. Some day I'll share the whole story of how I gave the table new life in Pumpkin Stem green. So, the fabric has a hint of green. And khaki, and a beautiful deep berry. Which leads me to the table top, where all the fun happens as I pick up colors from the fabric. The base on the lamp (a Target purchase) matches the red in the fabric, and the wood of the chair arms. 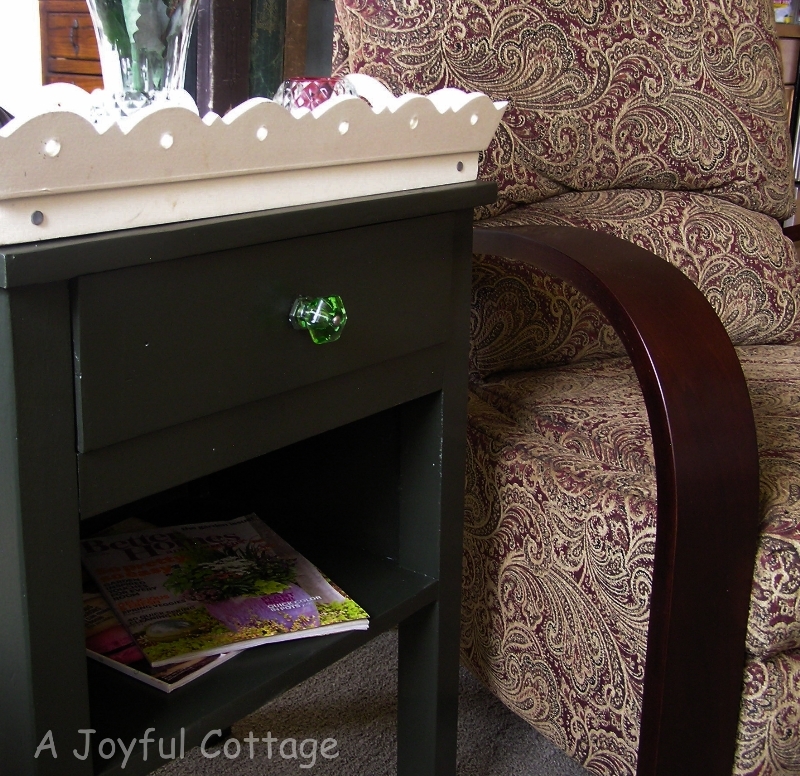 It has the vintage look I love, and the pretty shade is in the same color family as the vintage painted tray that holds all my pretties. 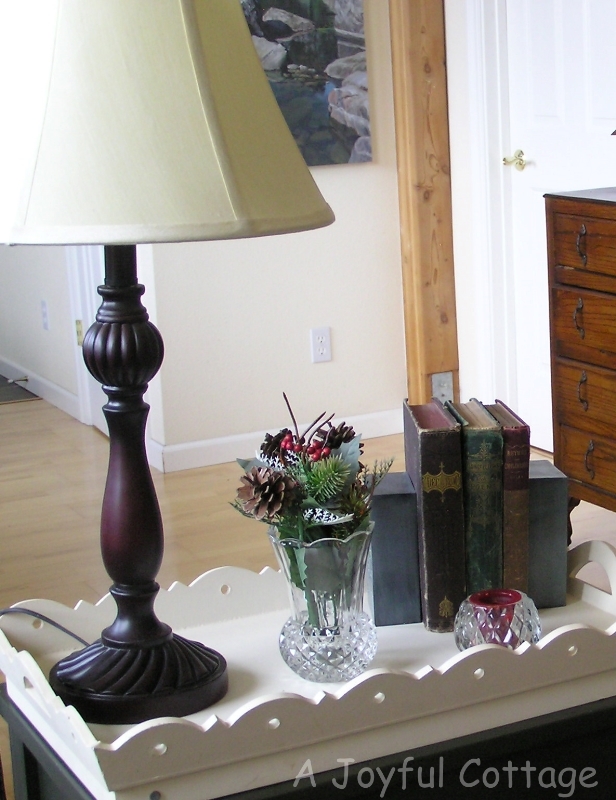 . .
Modern cut glass vase and tea light holder have vintage appeal, and hold berry accents. 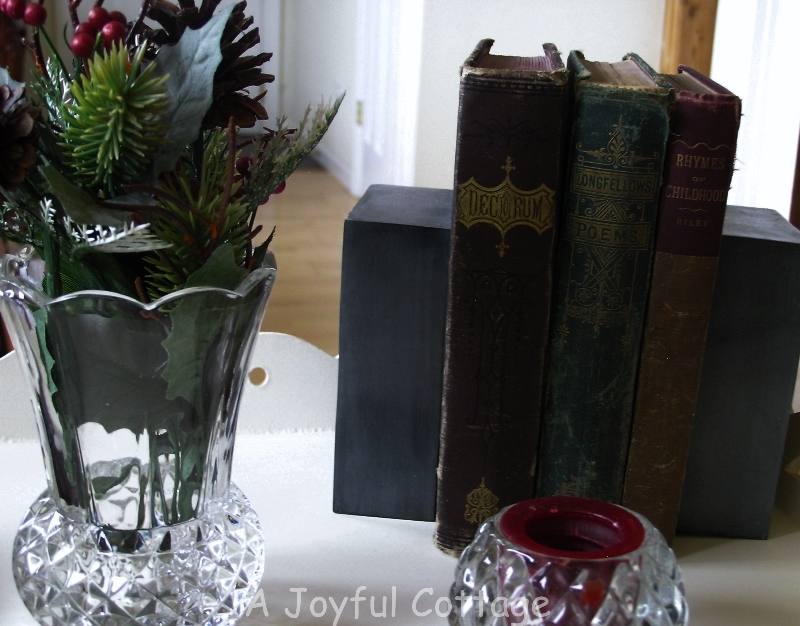 And my vintage books repeat the colors in the chair fabric. The bookends are new. That's how my vintage and modern pieces play nice together. Did you mix styles at all? Or do you pretty much stick to one period? P.S. Don't forget to link up your master bedroom posts at Every Room In The House if you haven't yet done so. We're partying in the Master Bedroom all month long. Can't wait to see what you share. Building your own cottage . . . your mind must be swimming with ideas. How very exciting, enjoy the planning. I mix things up, some old, some newer,a bit vintage, subtle color, accessories which can bend and flow with the seasons. My signatures are art pieces, from family, collections and friends . . . I am so excited for you . . .
How exciting that you will be building your own new cottage! Congratulations. Now your little area looks so pretty and so comfy. I love your chair and thought you were going to tell us that it was olden and you had recovered it! I love how you picked colours from the fabric for you vignette. It works perfectly. Thanks so much, Magali. You're so kind. It's going to be so much fun watching your cottage come along! Huge congratulations Nancy - how excited you must be knowing you will create your very own 'Joyful Cottage' from the ground up with all the bits and pieces you truly love. Will look forward to watching things move along - know how exuberant you get so betting you'll definitely wow us with lovely things - I'm truly happy for you and the Captain! Love that relaxation corner and the way you've decorated with a mix. 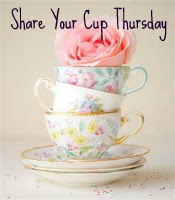 I'm very eclectic in my decor - vintage, antique and reproductions - things from many eras and several countries, especially France and England. I don't have any real modern/contemporary pieces as they're not really my style. That said, I LOVE your chair and can't believe it's actually a recliner, so much nicer than some of those elephantine monsters which just don't work in smaller rooms, such as my 'cottage'. 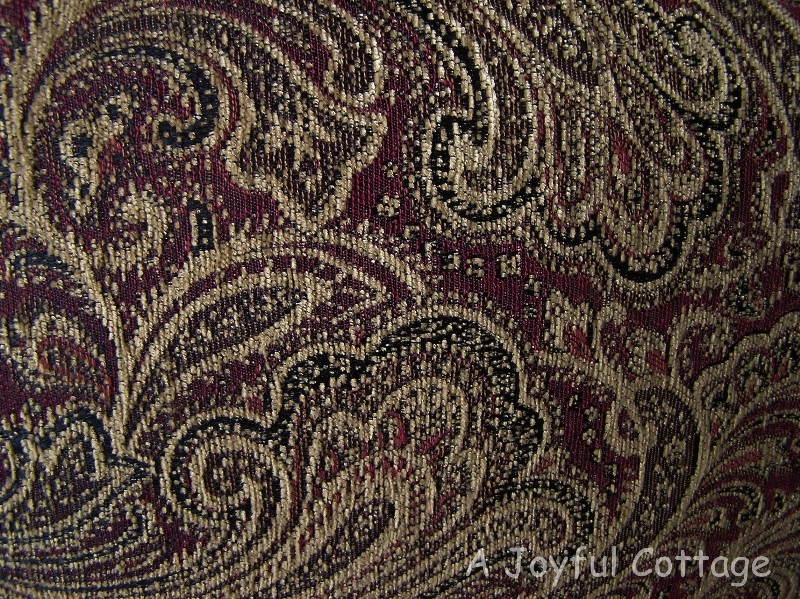 The paisley fabric is perfect and lovely colors. 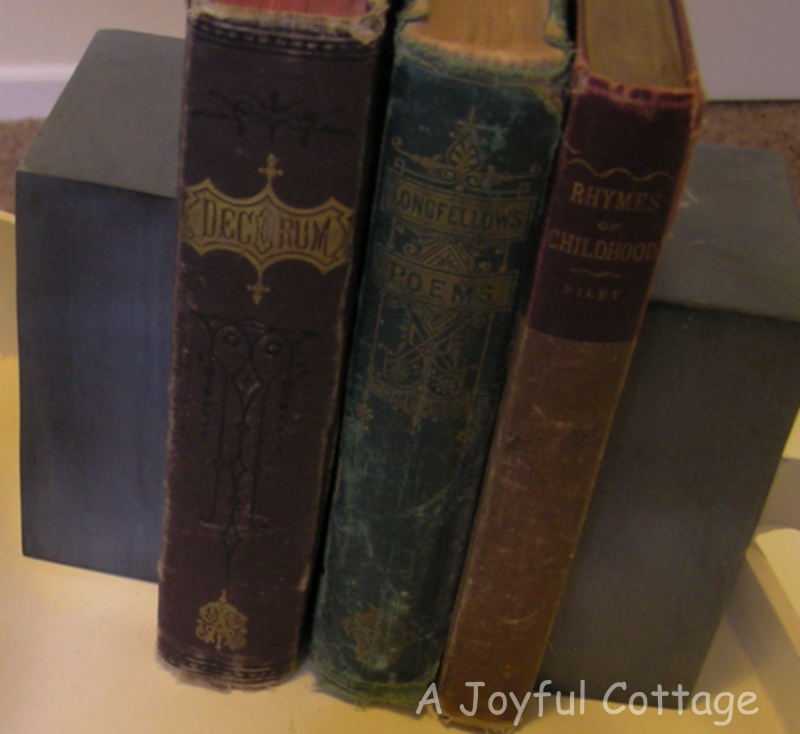 Beautiful book bindings! Enjoy your time preparing to build - do you already have your plans? I'm excited for you. Thanks, Deborah. And thanks for hosting your lovely party. Oh, I am so excited for you! 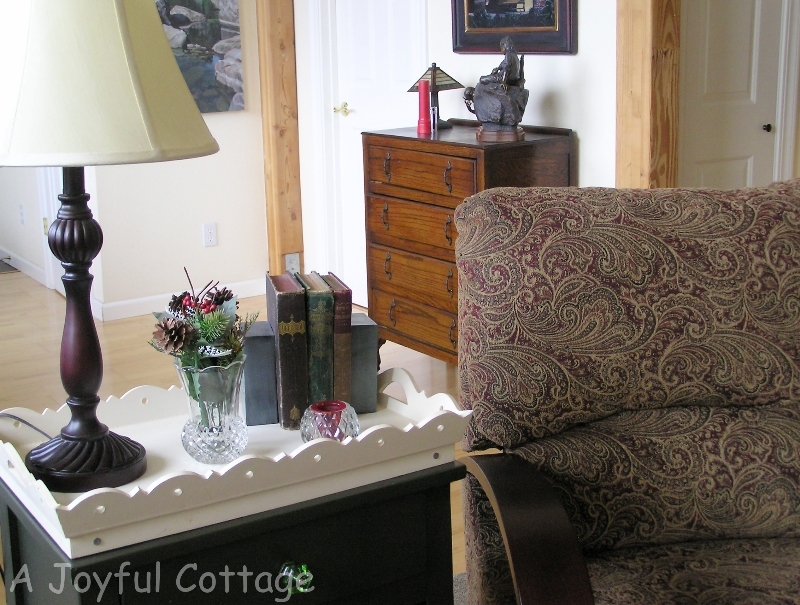 Your own cottage! Yay! Love the way you have mixed vintage with modern. It works! 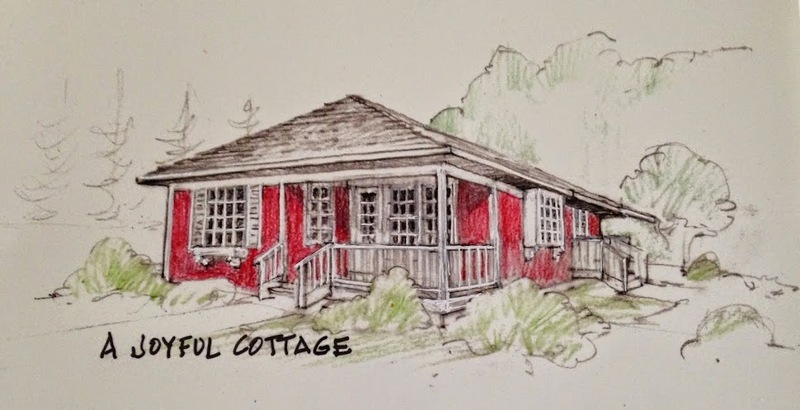 I can't wait to see how the new cottage comes to life! Thanks, Marie. We're pretty excited, too. Congrats on your build, how exciting! I love your chair! It's very similar to Ralph Lauren's paisley pattern. Really pretty. Have fun planning! !